I fancy myself an artist. Some days, it feels like I am a sandwich artist in search of a sandwich shop, but I still would like to be an artist. Why have I not donned a beret? The why is confidence, confidence spawned by economics and the academic nature of fine art. When it comes to the economics, I have not sold much of my artwork. 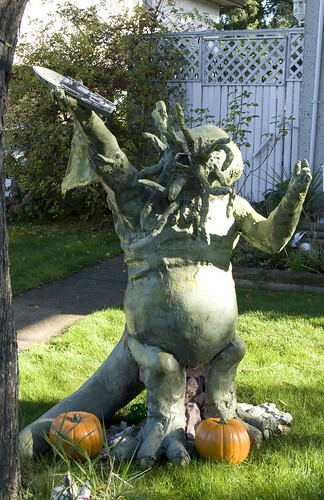 I put a man-sized Cthulhu sculpture onto my lawn. It stops traffic, but none of them notice the "For Sale" part of the sign. 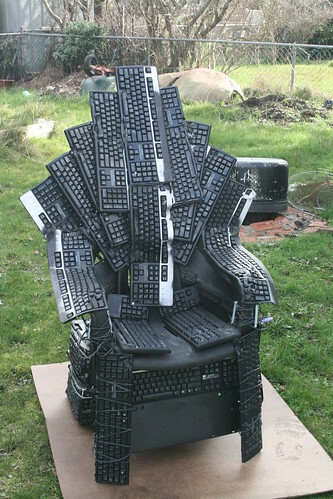 I have hundreds of hits per day of people looking at my Throne of Nerds. When people online say, "I want to buy that!" and I share the link to the purchase page, they don't follow through, falling silent. I have put my stuff into local shops. Some of it sells, but the pace is very slow. The concept of being an artist is internal. The validation about being an artist is external. A slow uptake of my artwork leaves me feeling invalidated. 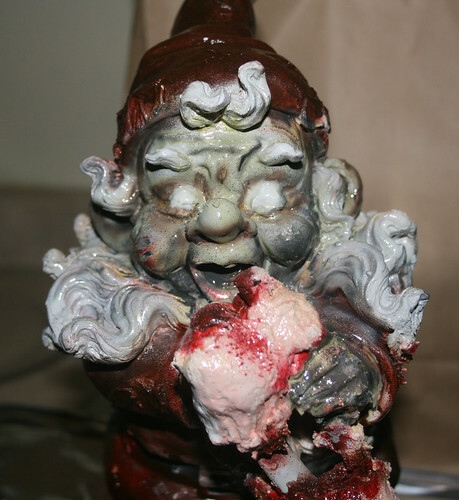 My art is weird, I'm the first to admit it. I am separating from my long time fixation with all things Cthulhu (I never intended to be on the subject for so long). 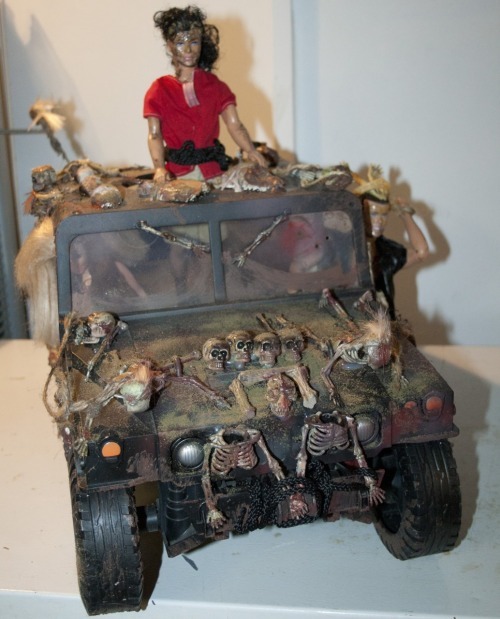 I have done other weird things: zombie garden gnomes; alien heads mounted as trophies; and a post-apocalyptic Barbie Hummer. Some of my work is rough. I go for the impression of the piece over and above the cold recreation of reality-- that's like from my early fascination with oil painting: this depiction of a scene, that, up close, look like peaks, piles and smudges of oil paint. I know others who have done art shows. I have not. I have enough material (I think) to take part in an art show, but the lack of sales makes me think that an art show is run before I walk concept. I my stuff "out there" and it doesn't do more than garner some uneasy regard. From a position of academic merits, I question if I what it takes. Victoria is home to lots of public art that makes people wince. When I decry the big water jug; or the stone bed; or the canoe atop tulips; the column ready to crush citizens-- those with fine art credentials leap to the defense of the public art. Okay: there's a disconnect. I think public art has to be more interesting than the successful execution of CYA holding to accepted theories in fine art. So, what did I do today? 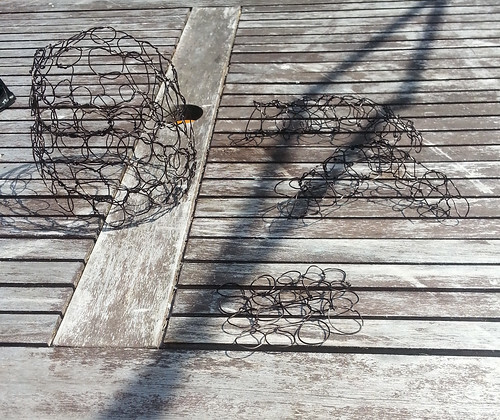 I took some wire out to the back deck and began putting together the proof of concept for a larger piece. What will it look like? Stay tuned. Art for me is an extension of the self. If my art needs to be embellished with more information about the motivation of the piece, I too, as an artist, need an artists statement.